Distinction: Highest mountain in Guatemala. 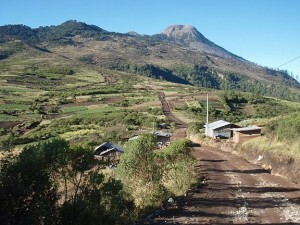 Summit of Tajumulco as seen from El Chico near the road. Summary: Getting to Tajumulco was more adventurous than the actual climb. I decided to leave my bike in Tapachula, Mexico just opposite the border with Guatemala. From there I went to the border by bus, crossed the border on foot, then took a taxi to the nearest village, then another bus up to San Marcos (a winding road through the rain forest climbing some 2000m vertical), stayed there overnight, and then another bus to a 3000+m high saddle called El Chico. From here Tajumulco ended up being a nice 3 hr hike to the top through pine forest and grassy meadows, somewhat reminiscent of a hike in the Alps above the tree line. The panorama view from the top was quite spectacular. Tajumulco and Mount Whitney in California were the only two 4000m peaks among the Panamerican Peaks, and both can be done in shorts and tennis shoes. 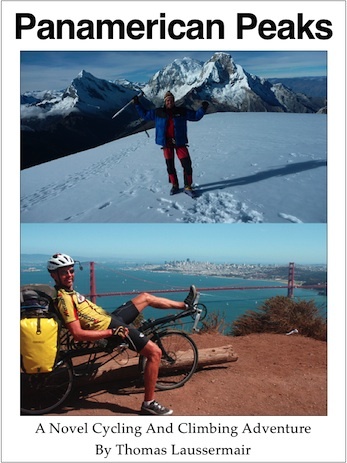 One starts to feel the altitude here, especially after coming up from cycling at sea-level and no prior acclimatization. Overall a very nice outing, the highest peak I have done in one day without sleeping in a tent or refugio.